If ever there was a model for how to write the biography of an inanimate object, this is it. Is it too early to be suggesting a contender for a Sibert award? Rappaport begins by imagining her grandfather's journey to Elllis Island, wondering what he must have thought and felt when he first saw the Statue of Liberty. She then jumps back to Edouard de Laboulaye's dream of giving America a gift of a grand monument to its independence. Then comes sculptor Auguste Bartholdi's work to capture the essence of this dream. Then comes Gustave Eiffel's work engineering the various components of this grand monument; and Joseph Pulitzer's newspaper accounts mocking the wealthy capitalists who refused to help fund the project while soliciting the donations of average Americans -- many recent immigrants themselves -- to see the project through; and Emma Lazarus's ruminations that led to the poem that adorns the base of Lady Liberty's foundation. Rappaport gives each person involved their say, each getting a free-verse voice in their part of the process while Matt Tavares singles out a particular moment to represent their efforts across the spread of pages. Each voice, each part of the process, brings Lady Liberty one step closer to completion. At it's core, Lady Liberty is as much a lesson on the birth of most collaborative arts. It's as complex as the planning and construction of a bridge, as complicated in its funding as an independent motion picture, and like most visionary works, difficult to imagine in the eyes of many who toiled toward a single visionary goal. It also highlights how another of those things assumed to be quintessentially American didn't originate in America and was viewed with skepticism and derision before ultimately being accepted. We didn't invent hot dogs or hamburgers, or even the fireworks we set off on the Fourth of July. Our national anthem was based on a British drinking song. But were it not for a French visionary, a French artist, an pro-Zionist poet, a Hungarian-born journalist, and multi-national labor force we most likely wouldn't have this symbol of liberty, this internationally recognized beacon of all things most Americans hold dear. 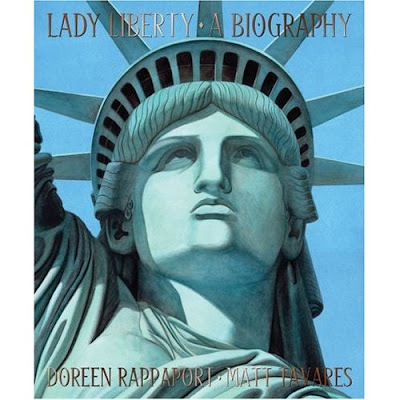 For those who cannot visit Liberty Island and follow the Lady's journey in her presence this book is an excellent alternative. Even better in some respects, because it clearly shows the connections between the people from different backgrounds and nations, in the same way this nation was constructed as a collaborative effort. A lesson I feel we need to reinforce for children in these divisive times.